…Many from the private sector are contributing to the relief effort. Toyota and Panasonic have pledged JPY 300 hundred million, and the head of the clothing company Uniqlo has offered JPY one billion as an individual. Doctors, nurses, and other volunteers have gone to the stricken area. We believe that the real strength supporting the recovery will arise from these expressions of goodwill, charity, and self-sacrifice. Unfortunately, from the perspective of the victims and private sector support, the relief and rescue activities of the Kan Naoto government have been insufficient. While it is true that the unprecedented size of the disaster has probably caused delays in gaining a clear view of the situation, we wonder if the government’s efforts to exert control have been so harsh as to squeeze out the private sector’s rescue and support activities. For some time after the earthquake, for example, expressways leading to the Tohoku region were restricted to emergency vehicles from the police, fire departments, and Self-Defense Forces. Private sector vehicles carrying food, fuel, and other supplies found it difficult to enter the area. It’s natural that the government would be in control of the efforts, but on the other hand, it’s not possible for them to have an accurate understanding of all the circumstances. It is essential that the activities be both detailed and adaptable, and that is possible only in the affected areas and the shelters. The Democratic Party government were the ones one to have brought up the concept of a “new public commons” to begin with. They also should have been the ones to actively support private sector NGOs shouldering the work of the public sector. Gemba Koichiro combines his portfolio as the Minister for National Policy with the special portfolio of Minister of State for the New Public Commons. One idea might be a sweeping expansion of the Furusato Nozei to create the funds for recovery. Under the current system, that is a mechanism in which households can contribute to specified local governments through deductions from their residential tax and income tax. The limits on these deductions could be raised. The mechanism could also be expanded to companies paying the corporate tax. The government would thereby encourage the private sector sentiment to help the people in the affected areas. We think this would be a splendid example in accord with the concept of a New Public Commons. LDP Head Tanigaki Sadakazu has proposed a tax increase to fund reconstruction, but it is not the work of government to conduct rebuilding enterprises using tax money. If the distribution of funds was entrusted to the private sector without government intermediation, it is likely that the money would be used effectively. Another idea is to establish a special recovery district. This district would be defined as the stricken territory without regard for prefectural or municipal borders. Preferential measures could be devised to enable private sector investment in the district and the use of tax money and subsidies for recovery activities. Again, the private sector should take the leading role–not the government. Measures designed to maximize human resources are also necessary. Many in the affected area are at loose ends after losing their families and their homes. If they were to be hired by NGOs or companies, the government might subsidize their salaries. This would better serve their needs than being hired by the government directly. The work of recovery presents employment opportunities. It is important that the basic approach should be to have the private sector take the lead in performing the work and to have the government provide support. The financial hit from the disaster will probably reach 11 figures in yen, if the amount resulting from the expected radiation leakage is included. We should not be surprised if the cost of the government’s recovery measures also reaches 11 figures. Finding the money to pay for those measures will present problems. Some have observed the confusion attending the implementation of the rolling blackouts and suggest that a surtax be levied on electric bills, citing energy conservation as the reason. Considering the chilling effect the disaster will have on the economy, however, tax increases should be avoided for the time being. We think it would be a better idea to have the Bank of Japan subscribe to bonds floated by the government. The BOJ might also increase the money supply by purchasing the bonds in the market. In any event, a joint effort by the government and the BOJ should send a strong message of the intent to rebuild even if extraordinary measures are taken. The basic issue when dealing with a crisis is the reasons for a government’s existence, and what a government is capable of doing. The fundamental job of the government is to protect people’s lives and their livelihoods. Nevertheless, the government is by no means omnipotent. We should have faith in our own abilities first. N.B. : The Furusato Nozei idea was devised a few years ago by current LDP head Tanigaki Sadakazu and championed by Suga Yoshihide as a way for people to contribute financially to their hometowns after they’d moved to a more urban area. The basic ideas in this common-sense editorial are quite good (except the one about the BOJ), but if we bet on form, it will go over the heads of the Kan administration. The most apt explanation for that is the Japanese expression Uma no mimi ni nenbutsu—Buddhist sutras in a horse’s ear. It as if Mr. Kan and his Cabinet are taking a page from the book of the unlamented Rahm Emmanuel, Barack Obama’s former chief of staff, who said that a crisis shouldn’t be allowed to go to waste. They’ve wasted little time in bringing up again the tax increase they’ve always wanted but were unlikely to achieve before the earthquake. One of the deals they cut to gain approval from Big Business for the increase was a reduction in the corporate tax rate. Now they’re ready to take that off the table. The Yomiuri Shimbun reported that talk was circulating of nationalizing Tokyo Electric, if only temporarily. Chief Cabinet Secretary Edano Yukio denied that it was being discussed by any organ of government, demonstrating that he is just as capable of mincing words as he is at slicing bologna. It was certainly mentioned within the Democratic Party, which controls the government. That was evidenced by Mr. Gemba’s rebuttal of Mr. Edano, saying that nationalization couldn’t be ruled out. Further, no one needed another demonstration that the left hand of the DPJ doesn’t know what its right hand is doing, but there it is. The nationalization of utilities can never be ruled out with governments of the left, and the Kan government in particular might find it a convenient step. They’re also thinking of applying the Act for the Compensation of Nuclear Damages for the first time and assume the complete liability for damage compensation. Those who qualify would be the 220,000 people who evacuated the area near the Fukushima plant, companies whose business suffered, and farmers who can’t sell crops due to concerns—even though the Kan government created the latter concerns themselves with bans of uncontaminated vegetables. The damages are estimated to exceed JPY one trillion. The law states that the power company should be liable for any damages from a nuclear accident, but one provision allows the government to assume that burden after large natural disasters or social upheaval. That raises the question of why anyone should be compensated for damages resulting from a natural disaster, absent a finding of negligence. That’s what insurance is for. But that’s a question the DPJ is incapable of answering. Unless they need an excuse to raise taxes. It’s not as if the DPJ is entirely serious about finding ways to save money and use the savings on relief. Even after the disaster, they wanted to maintain their unaffordable child subsidy scheme that most people didn’t want to begin with (and winds up costing some households money with the elimination of the income tax deduction for children). It’s one of the few pieces of legislation they’ve managed to pass that represents a clear difference from their predecessors. The subsidy is due to expire at the end of this month. Indeed, rather than cutting back, the government wanted to increase the payments to parents of children up to age three, but the DPJ’s lack of an upper house majority prevented its passage. Most of the opposition parties wanted to eliminate it altogether, but at the last minute the Communist Party said they would vote with the government to extend it. There you have the augend of two and the addend of two producing the sum of four as the motivation for the payments. It has nothing to do with increasing the birthrate, because that’s not possible. It has nothing to do with helping parents financially, because the income tax deduction was eliminated. Rather, it has everything to do with getting people accustomed to depending on cash payments from the government for things they should handle themselves. In other words, it’s a gateway drug program. Truman Capote famously said that he lost a point of IQ for every year he spent on the American West Coast. The endemic West Coast virus has infected the United States from sea to shining sea since Capote’s time, rendering geographical location irrelevant. The same effect can now be achieved, however, by reading any New York Times article on Japan. Those confident in their intellectual rigor can use their favorite search engine to find the Times’ latest exercise in the use of distorting mirrors. It’s headlined In Deference to Crisis, a New Obsession Sweeps Japan: Self-Restraint. Self-restraint is the term most commonly used to translate the Japanese word jishuku. This self-restraint is exercised, both individually and socially, when celebrations of any sort would be unseemly. For example, one funerary custom is to refrain from sending New Year’s cards when a close family member has died during the preceding year. People in Japan consider New Year’s to be a happy and auspicious occasion, which is evident from the o-medeto gozaimasu phrase used as a greeting during the season. Some people send cards later to explain the reason they didn’t send a New Year’s card. That same custom is observed by society after national disasters, such as the death in 1989 of the Showa Tenno and the Kobe earthquake in 1995. That the nation would respond in the same way after the Tohoku earthquake earlier this month should have been anticipated by anyone familiar with Japan. That leaves out the Times. The international section of a newspaper is supposed to be a window on the world presented by people employing nation- or region-specific expertise to provide information of interest or of use to the lay reader. What the Times presents instead is an upper-middle class Weird Japan article that gives its readers another excuse for self-congratulation. That much is obvious from the use of the words “new obsession” in the headline to describe a social custom that is probably more than a millennium old and isn’t obsessive in the least. And no, that word wasn’t chosen by some slope of a headline writer—the authors of the piece use the same term in the body of the article. A fact known only by those people who don’t know anything about the country. …a national consensus on the proper code of behavior has emerged with startling speed. Nothing startling about the speed at all—it arose naturally, as long-established customs do. The unfamiliarity of freewheeling Manhattanites with walking in lockstep seems to have rendered them incapable of recognizing a shared sense of national purpose. …anything with the barest hint of luxury invites condemnation. They of course offer no specific examples of the barest hints of luxury resulting in condemnation. In contrast, it would have been easy to find examples of Japanese commentators urging people not to get carried away with self-restraint—for those who read the Japanese-language print media. For example, Tobita Hidekazu, the director of the Kanagawa Keizai Doyukai, a business group, gave a speech in which he warned that self-restraint in areas unaffected by the earthquake–most of the country–could bring the economy to a standstill. He added that this was a good opportunity to implement tax breaks for companies that choose to relocate their headquarters or factories outside of Tokyo in regional areas. But his speech wasn’t delivered in central Tokyo, so the Times missed it. Cosmetics and karaoke are out; bottled water and Geiger counters are in. They could do their consumers a favor by choosing the appropriate tone–either that of the paper of record they pretend to be or that of a supermarket checkout stand tabloid. Smirking is incompatible with the former. The almost overnight transformation is likely to continue for months, if not years. At least this sentence is unobjectionable, including the last three words. The self-restraint won’t last years. The hot summer ahead is expected to further strain the nation’s electrical network, leading to more disruptive blackouts that make it hard for business to be conducted the Japanese way, face to face and often into the night. The authors seem not to have noticed that the Japanese also use e-mail these days. They also seem not to know that the western and eastern parts of the country are on different grids. That means the amount of electricity Western Japan can contribute is limited, so the strain on the network will not be nationwide. The vast entertainment industry that greases corporate Japan, including sushi bars and cabarets, is likely to be deeply hurt. Last weekend, my wife, two brothers-in-law, a sister-in-law, and I took the Shinkansen to another city to attend a wedding. We spent the night there, so 10 of us went out to dinner together afterward. The downtown restaurant was so crowded we had to wait for half an hour to be seated. We decided to stick it out because the wait at all the other restaurants in the building would have been just as long. The Kyushu leg of the Shinkansen began full service one day after the earthquake. There were supposed to be ceremonies commemorating the start of service, but they were cancelled. The Shinkansen service itself began as scheduled. That is typical of what self-restraint means in these circumstances. Were the editors on a coffee break, or is contorted prose and a superior attitude part of the Times stylebook? The authors mention that politicians running in the upcoming gubernatorial election for the Tokyo Metro District have toned down their campaigning. They quote only Higashikokubaru Hideo, however, and identify him as a “politician” and “former comedian” without citing his successful term as governor of Miyazaki Prefecture. Conforming to the guidelines of the Weird Japan style manual, they also present examples of politicians who will not exercise self-restraint in the election—the Communist Party, which few people pay attention to, and a vanity candidate. And they think the Japanese are insular? While the Chubun Shimbun editorial is full of good suggestions, and the New York Times article is just full of it, a recent Dong-a Ilbo editorial is chock full of the deep-space eccentric wackiness that characterizes much of the South Korean approach to the Takeshima issue. In baseball terms, you might say it’s the face of the franchise. The Japanese government recently restated its claim to the islets, which the South Koreans seized by force more than 50 years ago. That was all it took for the newspaper to break out in a truther/birther/Heaven’s Gate rash. The Dong-a finds it mighty suspicious that the Japanese bring up their claims anywhere from four days to one month after one of several North Korean outrages, and “soon after” the Lee Myung-bak administration was inaugurated and anti-American protests about beef imports evolved into anti-government protests. It hasn’t occurred to them how easy it would be for any event to occur in temporal proximity to the most recent unanswered Pyeongyang provocation or a South Korean street demonstration. They don’t explain what they think the point of the timing would be, or what they think the Japanese might gain from it. They’re just sayin’. There are other possibilities than the figment of Japanese neo-colonialism in the Joseon imagination, however. One might be that the default state of mind about anything to do with Japan in the Korean media is semi-hysteria. Another is that some South Koreans share a personality quirk with the fictional Basil Fawlty, who thought an order for shrimp cocktail from a German patron in his dining room was a reference to the Second World War. If it is true, as some South Koreans suggest, that the Japanese restatement of the claim puts a damper on the former country’s sympathy following the earthquake, then that sympathy was only ankle deep to begin with. The Chinese in Tokyo also succumbed to the vapors. The following photo was taken in Narita Airport on the 18th. 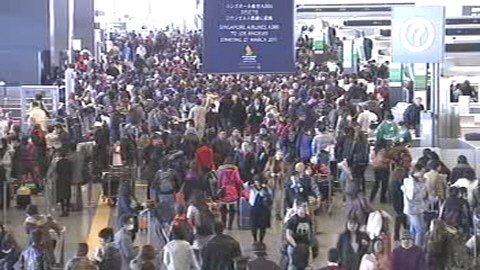 The lines at the Chinese airline company counters were reported to have been 400 meters long. Speaking of hysteria, here’s a link to an article about how the problems at the Fukushima reactor have caused frothing at the mind in Europe. And to close on a more realistic note, here’s a link to an article that offers six reasons why Fukushima is not Chernobyl. Thanks to Get A Job Son for the link to the Times article. Talking loud and sayin’ nothing in New York, Seoul, Nagata-cho…and Shinjuku too. THE WORD nasake in Japanese means sympathy, compassion, or fellow feeling. It appears in the proverb, Nasake ha hito no tame narazu. That literally would be “Compassion is not for the benefit of other people.” It’s actually used, however, to mean that if you help someone in trouble, he’ll be sure to do you a good turn when you need it. The truth behind the proverb was borne out earlier this week when the Foreign Ministry revealed that 130 countries and territories had offered assistance to Japan in one form or another after the Tohoku earthquake and tsunami. Bringing the total to 130 were the offers from Brunei and Haiti. While the normal sentiments of charity and compassion surely inspired the offers, the generous Japanese ODA program and disaster assistance over the years were likely factors as well, demonstrated by Haiti’s message. When more than 220,000 people died in the Haitian earthquake last year, the Japanese contributed $US 70 million and sent a medical team and the Self-Defense Forces. Huis ten Bosch (House in the Forest) in The Hague is one of the official residences of the Dutch Royal Family. It’s also the name of a theme park in Sasebo, Nagasaki, in which The Netherlands is recreated with full-size replicas of Dutch buildings. The 152-hectare resort—roughly the size of Monaco—was built with the approval of the Dutch royal house. In addition to the buildings, there are forests, gardens, amusements, shops, restaurants, five hotels, a marina, and a residential area. Earlier this week Nagasaki Gov. Nakamura Hodo said that Huis ten Bosch and 37 ryokan (traditional Japanese inns) with hot springs would accommodate 1,700 people from 538 households left homeless by the earthquake. The prefectural government will be responsible for their clothing, food, and the transportation expenses from Tohoku. They’ll also help place people in schools and jobs. The Maritime Agency reported that the Nisshin-maru, the mother ship of Japan’s whaling fleet, would sail today to transport supplies to the Tohoku region. The fleet had just returned from the South Pacific after ending their expedition early due to concerns over crew safety stemming from Sea Shepherd harassment. The agency said the idea to help came from the crew members themselves, many of whom are natives of Iwate and Miyagi. The Nisshin-maru’s cargo is primarily heating oil and food. A group of 57 firemen from Tokushima in Shikoku returned from a rescue and assistance operation in Miyagi earlier this week. Group leader Igawa Hiroyuki said one of their tasks was to transport elderly people from hospitals with power outages to other facilities with heat. They also worked with a group of firefighters from Nagano to search for missing people from a large agricultural facility destroyed by the tsunami. The metal frames of the greenhouses remained, but the people didn’t. He added that a site for identifying the deceased was set up in a public park, and there was always a long line of people waiting to get in. He hopes to use the experience gained from the mission to help Tokushima prepare for an earthquake. The word nasake also appears in the expression nasake nai, or cold, unfeeling, and cruel. Some people might think Kamei Shizuka’s comment about the Cabinet at a news conference on the 23rd qualifies as nasake nai, especially considering the People’s New Party he heads is still part of the ruling coalition. Particularly when the nominal captain behaves as if he’s a clone for Lieutenant Commander Phillip Francis Queeg. The truth may be nasake nai, but it’s still the truth. The first recorded story of the proto-gangster Merry Men is called Robin Hood and the Monk and dates from 1450. In this tale, Little John kills a monk, Much the Miller murders a boy to prevent their identification, and Robin welshes on a bet with Little John. The love interest with Maid Marian was a later addition by the French–no surprise there–and even then, she was getting it on with Friar Tuck instead of Robin. Scratch “post-war period” and replace it with “Edo period”, which was from 1603-1868. The subject requires a lot of historical detail to explain, but the groups were in the odd position of being both outlaws and, at times, empowered to maintain public order. There’s also been an anti-authoritarian/guerilla band streak to their activities as well. They’ve participated on the side of the farmers in farmer rebellions throughout Japanese history. In his book Yakuza to Nihonjin (Yakuza and the Japanese), Ino Kenji devotes a lot of space to their involvement in the Chichibu Incident, a farmers’ revolt of two weeks’ duration in Saitama in 1884. Their adherence to the code of ninkyo didn’t prevent them from hiring on as the muscle to crush labor, left-wing, and burakumin liberation movements, however. The Japanese themselves often refer to the yakuza as parasites. Perhaps their readiness to provide disaster assistance is an expression of altruism and patriotism. But parasites also instinctively understand they can’t survive without a healthy host. Again, this isn’t an exclusively post-war phenomenon. An interesting contrast, by the way, is Prime Minister Kan Naoto’s appointment of Diet member Tsujimoto Kiyomi to coordinate volunteer efforts in the Tohoku region. 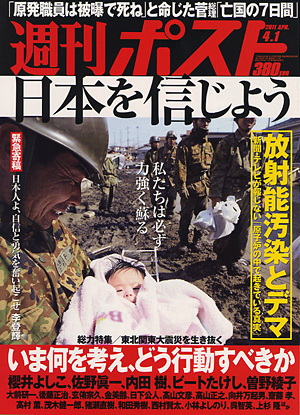 After the Kobe earthquake, she went to the area to distribute anti-government leaflets. I don’t understand the last sentence, least of all why it would make the police look foolish. What I would understand is a sentence explaining that the widespread public knowledge of heroic, selfless activities might vitiate to an extent the efforts of police and the private sector to crack down on them. These efforts include the cooperation of some sub-national governments with the financial services industry in Kyushu of late to cut off bank lending to individuals or companies known to be associated with the yakuza. That’s a good interpretation of giri, though it does omit the sense of obligation. But the people in Japan who value giri also expect women to honor it as well. The Sumiyoshi-kai, incidentally, are considered a particularly nasty organization. Reports say that the country’s largest group, the Yamaguchi-gumi, prohibits drug trafficking as a matter of organizational policy, but the Sumiyoshi-kai deal in weapons and drugs with the North Koreans. Oy, this again. That he would offer refuge might be unheard of, but the scale of destruction in the Tohoku region is also unheard of. These guys aren’t in the business of running shelters for the homeless. As for xenophobia, we’ve recently seen that an estimated 10-20% of gang members are Japanese-born Korean nationals, some of whom have become gang leaders. Perhaps the xenophobia doesn’t extend to other Asians. Also, xenophobia is not exclusively a right-wing phenomenon, as some of the policies of the British National Party demonstrate. And “slightly xenophobic” compared to whom? I could make a case that the United States is still “slightly xenophobic”, as if the International Bureau of Weights and Measures had phobia-meters for that sort of thing. It’s worth a visit to the foreign-language pages of local government websites throughout this country to get an idea of the many services they provide to non-Japanese residents. Indeed, some of the yakuza I’ve encountered have been just as curious about me and ready to strike up a conversation as any other Japanese. Some years ago, I was invited to a family get-together (of a family that were probably burakumin), and I was told in advance that the gangster husband of one of the relatives would be there. (They didn’t want me to freak out when I found out who he was. They assured me he was perfectly safe in this context.) He certainly wasn’t xenophobic; if anything, he was the opposite. After a couple of hours, it got to the point that I started wishing he would give me a break and talk to someone else. That was also the case with the two or three yakuza members who happened to sit next to my table at a yakitori shop one night. To be sure, they had already worked up a full head of steam by the time they got there, but they were full of questions for me and had no hesitation answering mine. One of them even unbuttoned his sleeves and the front of his shirt to show me his tattoos without being asked. They were quite artistic. The Japanese guys I was with were ambivalent about the experience. On the one hand, they didn’t mind the rounds of beer that were being bought for us because of my presence. (See how xenophobic they are?) On the other hand, one of them told me later that they were too frightened to go to the bathroom lest the hoods take offense at people leaving their presence without permission. They don’t want the Japanese to know what they’re doing, but they went out of their way to tell Mr. Edelstein, who no longer works as a reporter. Why would they do that? Because they understand that information published in English about Japan, especially information that isn’t widely discussed in public, will eventually slip into Japan through the back door. By that time, their donations will already have been distributed. In other words, an ex-journalist has gotten back into harness to perform once again the journalistic function of serving as a PR conduit for his sources. In exchange, he gets to file a colorful story with inside information. Note that he considered the late boss of the Sumiyoshi-kai, a gang the Japanese think is the most vicious of the lot, to be his friend. Imagine what Americans would think if a Japanese reporter filed a story in Tokyo promoting the Chicago mob’s Robin Hood-like behavior after a disaster, while letting it slip into the article that Al Capone was his friend. Mr. Edelstein did make sure to tell us that he thinks the gangsters are sexist, sociopathic thugs. But why should they care? They got the PR they wanted. Giri takes many forms, it would seem. Even if their recent benevolent activities were better known, however, it probably wouldn’t change the attitude of people like my wife. There’s a for-profit parking lot in a nearby commercial/restaurant district whose yakuza ownership is commonly known. She refuses to park there, and insists that we use the next closest lot instead. That usually adds another five minutes to the walk to our destination. For some people, it’s a matter of principle. That’s your wife on the back of my horse, sheriff. SUNDAY MORNING at 10 o’clock, a Buddhist memorial service was conducted for my father-in-law, who died last year, and my sister-in-law, who died 24 years ago. It was held at a temple near my wife’s family home, where my brother-in-law and his family now live. It ended about an hour later, and then we had lunch in a nearby banquet hall. The hall sent a bus large enough for 25-30 passengers to the family home, and we went in a group. The priest came too. There was plenty of good food and drink served by amiable waitresses in kimono who made sure that no one had to ask for anything. Everyone enjoyed themselves. Some people hadn’t seen each other since the series of services for my father-in-law. There was a nice present for each family that came. This is part of what people mean when they talk about ancestor worship in Japan. It was raining hard when it was time to go home, so the employees of the hall opened umbrellas and escorted the party one by one to the bus. They would have seen us to the door regardless of the weather. The family home is in Morodomi, on the Chikugo River, an old district said to have been the point of arrival in Japan for the Chinese explorer Xu Fu (徐福, or Jofuku in Japanese). The drive took about five minutes, but it required navigating some narrow streets with tight turns. The town was laid out long before modern automobile traffic had to be taken into consideration. The demeanor of the bus driver, a man in his mid-30s, was what the Japanese might call heiki—calm, and self-possessed. Both careful and confident, he maintained a roughly constant rate of speed. There wasn’t much room for error to turn a bus that large on roads that small, but he handled it with expertise. At no time did he come to a full stop. My wife’s family was in the business of producing nori, the dark green paper-like wafers made of seaweed used to wrap rolled sushi. There’s a large shed on the property housing all the machinery, and just enough space to park a few cars and mini-trucks. The area between the house and the shed is covered and can be used as a carport. Without hesitation, the driver pulled straight into it so his passengers wouldn’t have to disembark in the rain. People here notice these things. Several passengers remarked on the driver’s thoughtfulness, loud enough for him to hear. Everyone thanked him as they got off. He just nodded; he thought it was part of his job. Then again, they would have thanked him if the weather had been clear and he parked out in the open. The layout of the parking area is such that he couldn’t turn the bus around. He had to back out for a distance of about 50 yards, half of which is along a path with little room on either side. Then he had to edge out onto the adjoining street while checking for traffic from the far end of the bus. The large mirrors placed at small intersections giving a view of oncoming traffic from both left and right made it easier. No one said a word, but two or three people opened their umbrellas and walked alongside to help. The driver didn’t need it. He left as smoothly as he came. The most remarkable part of this episode is that in Japan, none of it is remarkable at all. This is what happens in everyday life. Quite a few people on the web have been offering theories to explain the reasons that looting and thievery in the Tohoku area after the earthquake/tsunami have occurred much less frequently than they would expect it to occur in other places. They’ve cited IQ, population genetics, geography, shared history, benign ethno-nationalism, and social stability with a well-defined hierarchy. I don’t need the theories. I saw the reason–again–with my own eyes today. LIFE its own self continues…. They will have to make massive payments, but they might not have to liquidate assets to do it. At a press conference on the 17th, Suzuki Hisahito, the chairman of the General Insurance Association of Japan, said he expects the payouts for earthquake insurance in the Tohoku quake to exceed the previous record high of JPY 78.3 billion (just under $US one billion) paid after the Kobe earthquake. He offered a rough estimate of several hundred billion yen. Mr. Suzuki explained the insurers are liable for everything up to an amount of JPY 115 billion. The government and the private sector insurers will split the liability equally for benefits exceeding that amount. Further, the government will be liable for 95% of the amount if the combined payout of the government and the private sector exceeds JPY 1.9250 billion. One factor contributing to a much higher payment, apart from the scale of the disaster, is that public awareness of earthquake insurance rose after the Kobe quake. Mr. Suzuki thinks the payments won’t have a serious impact on the insurers’ business. The government and the insurers had aggregate reserves of JPY 2.919 trillion as of the end of 2009, JPY 1 trillion of which is the private sector portion. The chairman thinks those reserves will be cover the claims. The insurance companies might have to liquidate some assets, but that would come after the payout to restore the reserves. I hold no truck for mixing politics and religion, but since becoming party chair in September 2009, Yamaguchi Natsuo has often spoken with uncommon good sense. He’s done it again: Now he’s proposing that all Diet members cut their salary by one-third for a year and allocate the funds to rebuilding the country. During a news conference on the 16th, Chief Cabinet Secretary Edano Yuko asked that people outside the Tohoku region not get carried away with panic buying and hoarding. He repeated the request later and said the government would consider coercive measures to prevent it. The accompanying photo was taken on the afternoon of the 16th as a deliveryman wheeled in one of two loads of 29 cases of instant meals to the DPJ’s private chambers in the Diet building. Each case carries 12 packaged meals. The next sentence in the newspaper report was a reminder of how few campaign promises the DPJ has kept. As for the food itself, reporters spied two types of yakisoba with sauce. The DPJ doesn’t seem to know the expression about sauce for the goose being sauce for the gander. The United States deployed 280,000 soldiers to invade Iraq, a total accounting for 11% of their armed forces. The maximum American military deployment during the occupation was 171,000 people in 2007, or 6.9%. In comparison, about 100,000 of Japan’s Self-Defense Forces are involved in the relief effort, or 42% of the country’s military manpower. Adding the support personnel brings the total to 180,000, or 75% of the overall strength. Lieutenant Commander Philip Francis Queeg Prime Minister Kan Naoto made the decision on troop deployment. First he settled on 20,000 people on the 12th, but it grew to 50,000 later in the day. By the evening of the 13th, the total had swelled to 100,000. Ministry of Defense sources say they were never consulted. The media finds it curious that The Man Who Would Be Boss, Ozawa Ichiro, has been keeping a low profile this week. Mr. Ozawa, currently suspended from the DPJ he once led for his recent indictment over a political funding scandal, represents a lower house district from Iwate, one of the three prefectures hardest hit by the earthquake. His current district is Iwate #4, located inland away from the area where the tsunami hit. When districts were larger before the Diet reorganization, however, he represented two cities with 373 confirmed deaths and more than 1,000 missing as of the morning of the 16th. He hasn’t been to the district since the earthquake—he certainly has the money to rent a helicopter—nor has he said anything in public. The last update to his website was on the 11th, the day of the earthquake, inviting people to a fund-raising party in April. Some are wondering if he’s doing what he does best—political scheming. He held a meeting of loyal MPs on the 10th, the day before the quake, and told them to get ready for an election because the lower house would be dissolved soon. An Ozawa aide objected that of course his boss is concerned, but he’d only get in the way if he visited the area. He plans to visit after the situation has stabilized. If the aide had anything to say about the lack of a website update, it wasn’t reported. It’s serious, but it’s nowhere near that bad. The devastation now is primarily in three prefectures. Then it was spread throughout the country. That sounds suspiciously like a man who wants to turn a natural disaster into political capital. The people upset with the DPJ’s disaster response (and there are many) have one consolation—at least Sengoku Yoshito is no longer the chief cabinet secretary. The person in that job has the primary responsibility for providing information to the public. Let’s count our blessings: detested for his insulting demeanor when dealing with opposition politicians and the media, detested for his attempt to shirk responsibility for the government’s mishandling of the Senkakus incident, detested for copping an attitude from the sokaiya gangsters he once defended…so detested Mr. Kan had to can him when the upper house censured him after only six months in office. Imagine what the news conferences over the past week would have been like if he were conducting them. He was also detested for behaving as the de facto prime minister behind the scenes because he thought Kan Naoto wasn’t up to the job. Well, we can cut him some slack on that one. But he’s back! One of Mr. Kan’s aides resigned, and he was replaced by Deputy Chief Cabinet Secretary Fujii Hirohisa. It was thought the 78-year-old ex-Finance Ministry bureaucrat and finance minister with a rumored taste for the daytime grape couldn’t physically cope with the work involved in coordinating disaster relief, so Mr. Sengoku assumed his duties. By all accounts he’s an intelligent and capable man apart from his repellent personality and political behavior, so he’ll probably be effective in providing some much-needed organizational skills to his disorganized party mates. His new job won’t require much direct contact with the public, media, or opposition politicians, which is the way they’ll like it. Now let’s hope he learned his lesson from hiding the Coast Guard video showing the collision with the Chinese fishing vessel. Unfortunately, people who throw their intelligence around the way bullies throw their weight around are not often susceptible to re-education. OSAKA / Television stations here on Thursday were broadcasting golf tournaments and game shows, supermarket shelves were packed with plentiful products and fancy foods and department stores buzzed with content customers carrying bags of recently purchased goods. This port city in the heart of Japan’s second largest metropolitan area of Kansai 400 kilometers southwest of Tokyo seems little affected, perhaps even willfully oblivious to what’s going on in the northeast of the country, where the drama at the critically damaged Fukushima nuclear power continues to unfold. Is it so difficult to understand that it isn’t “eerie” to behave normally when everything about you is normal? Normality includes television returning to its regular schedule, supermarkets in a prosperous country being “packed with plentiful products”, and people going shopping. Does the author expect everyone to curl up in a corner and moan? The suggestion that people are “willfully oblivious”—on no basis other than a hyperactive imagination–has no business in a news story. As for using the word “drama” to describe a life-or-death situation, the English-language media have been doing that for nearly 40 years. By now it’s futile to expect them to learn the distinction between the stage and life its own self. This attitude would be unremarkable for most news media outlets–after all, to them 380,000 people in shelters is “nearly half a million”. But it’s incomprehensible for this one—the newspaper publishing the article was the Jerusalem Post. This week, people have been offering each other encouragement. Today, one woman from Gunma sent this message: I don’t have time to cry. I’ll put that emotion off for some other time. It’s important now to live, and to keep a smile on my face. Let that be a lesson for us all. Leave it to someone with a cubicle in the Ivory Tower to describe devastation as “sublime”; Webster’s defines that word as something inspiring awe through grandeur or beauty. The unconscious exposure of self-absorption is just as much a constant among academics as it is among journalists. The only differences are that the former use more complex sentences and often conduct actual research. Some people regret that modern affluence has robbed us of our connection to the realities of life. The Rational Optimist Matt Ridley quickly dismisses that idea using a copy of the newspaper clipping that he borrowed from another site, and which I swiped from him. The title of his post is, Wealth and Technology Make the Death Toll Smaller, Not Larger. Another constant resulting from a natural disaster is confusion; no one can be sure of actual conditions. For example, many in Japan were relieved to read that the Self-Defense Forces were given responsibility on Monday for distributing food and supplies. That means the job is in the hands of highly trained people who understand logistics and how to coordinate the actions of a large group. They will also be undeterred by any consideration other than that of accomplishing their mission. Based on his experience working in television, Mr. Tatsumi says that news crews go only to the safest areas and are prevented by the broadcast code from showing the worst images. Those images will be seen, he predicts, when the magazines publish special issues on the earthquake and run the gruesome photos. Is his friend unnerved by the proximity of such death and destruction, or is the situation as dire as he describes? That’s another constant: We’ll have to wait and see. “(T)here are two reasons that the earthquake may not trigger a sharp rise in (bond) yields. First, the quake is unlikely to force insurance companies to make massive payments for earthquake damage, since only about 18.5% of Japanese households have earthquake insurance, according to reports. If those insurers don’t have to make massive payments, they probably won’t have to liquidate assets like JGBs. “In fact, Japanese bonds have remained stable and the yen has even strengthened since the disaster. Economists have attributed this phenomenon to speculation that Japanese institutions could sell US Treasuries to raise money, and that domestic companies might repatriate money to pay for earthquake damages. Japan, the largest buyer of US debt after China, could also momentarily stop buying Treasuries while it figures out how much it needs to spend on rescue and clean up efforts. “Second, Japan holds more than 95% of its own debt, according to Bank of Japan data. Even if foreign investors began to unload their bonds, they account for a small part of the overall market. Her article suggests that the Americans are the ones who should have more pressing concerns about the disaster’s effect on sovereign debt. Who’ll offset the shortfall in the purchase of Treasuries if the Japanese use the money for themselves? That’s one of the reasons a financial advice peddler named Chris Martensen has turned into a fountain of hysteria warning of a global meltdown, as you can see here in a link sent in by both readers Marellus and 21st Century Schizoid Man. His advice for Americans on the West Coast is to prepare for a “fallout event”, while he urges the rest of us to top off our fuel tanks, buy extra food at the grocery store, have long-term storage food put aside, and get extra medicine. He also advises us to stock up on chocolate and other luxury items that will be at a “mental premium”. This will help, he says, those grasshopper friends and relatives who didn’t prepare for disaster. What he doesn’t say, but probably thinks, is that the Kit-Kats can be used as a financial instrument for later sale at mental premium prices. Also worth noting is his disclaimer that, “I cannot fully support 100% of my concerns with hard data and evidence”, his unawareness that the region affected by the earthquake is not a major manufacturing center, and his need to identify himself on the masthead as a Ph.D. The confusion about the threats of nuclear disaster is natural because the fears of the harmful effects are exacerbated by the cyber-equivalent of street-corner Bible thumpers and bearded sandwich-board doomsters. Some people are thumping their chests instead of Bibles and bristling with exclamation points to declare, I told you so! The nuclear power industry is already funding a tsunami of pro-nuke propaganda on the web! “(T)he Japanese themselves have taught us, in the most awful way imaginable, what the actual health danger of radiation like this might be, and we need to keep the lessons of Hiroshima and Nagasaki in mind as we assess how catastrophic events like this actually are. That last sentence is no exaggeration, either, as you can see from this article, which resembles an account of a safari in search of wild game. Tom G. Palmer points out once more that disasters do not create wealth. Perhaps this will penetrate some of those with the ears to hear. Keynes didn’t get much right, but one thing he nailed was the importance of ruthless truth-telling. As for the integration of East Asia, readers of this site are among those who know that East Asia is already integrating economically quite well on its own. A natural disaster has nothing to contribute to the process. As for political integration, no one takes that seriously except Hatoyama Yukio; the vapor-based community at think tanks, universities, and editorial offices; and the bureaucrats and other political time-servers in the West. Few people even in Mr. Hatoyama’s Democratic Party thought it was an achievable or worthwhile goal. They humored the man because he bought and paid for the party and happened to be in position to become prime minister when it took control of the government after the August 2009 election. Since his departure last May, I haven’t seen it mentioned at all. The DPJ unwillingness to give up the child support payments is understandable because it would roll back their primary legislative achievement. Even they probably realize it won’t have an effect on the birth rate despite their claims; their primary interest was strengthening the social welfare state. They also know that in the next Diet election many of them will be swept away by another tsunami of historical proportions, so they’re anxious to preserve whatever form of it they can. And speaking of the DPJ getting flayed in local elections, the people of Nagoya held a City Council election on Sunday after the council was recalled by voters in February. They somehow managed to drag themselves to polling places despite the paralysis, desperation, and fear gripping the country, as described by some in the Western media. As we saw at the time, that recall was the most visible expression to date of the ongoing revolt of the Japanese voter. There are 75 seats in the council, and Mayor Kawamura Takashi’s tax-cutting and government downsizing party took 28 of them. They are now the leading party in the chamber, but fell short of their target of an overall majority. The DPJ had been the leading party, but their representation was slashed from 27 to 11. The LDP and New Komeito have even fewer seats. “But the focus on the quotidian that Mishima abhorred ended at 2:46 p.m. on 11 March. Without fear of expressing myself poorly, I will say this country has experienced a discontinuance of the quotidian for the first time since the Second World War. We must rebuild our country once again. Horie Takafumi went from youthful entrepreneur and media sensation to jailbird. Since returning to shaba, a Buddhist term for the everyday world that incarcerated gangsters appropriated as slang for the streets outside, he’s started to appear on television again and has a blog. Reader 21st Century Schizoid Man sent in a link to his latest Japanese-language entry. Here it is in English. In other words, it would be as if they contracted an incurable illness. But if all of Japan can be compared to a single human being, it isn’t an illness that will cause the person’s death. People will be unable to live in the area for a while, and we will have to live with that illness for the rest of our lives. The most pressing concern is whether Tokyo, the heart of Japan, and the economy, the country’s circulatory system, will cease to function. If that were to happen, it is possible that Japan would die. We should gather information ourselves and make the appropriate judgments without being led astray by strange psychological theories or urban legends. At the minimum, there is absolutely no need to evacuate Tokyo at the present. What we should do instead is go to work as we normally would, and consume as we normally would. Nothing can be done when one’s district is affected by the rolling blackouts, but other than that, there’s no need to curl up and cower, and we certainly shouldn’t buy things out of panic. There’s also no need for people who live in areas other than those supplied by Tohoku Electric or Tokyo Electric to conserve electricity. The Kanto and Kansai areas use different frequencies, so Chubu Electric and the other power companies to the west can send a maximum of only about 1.07 million kW. The most that Hokkaido Electric can accommodate is 600,000 kW. The measures to do so have already been taken. To say that we will have to suspend events or modify our behavior in similar ways because it would look bad or be unseemly for the people in the stricken areas is the height of stupidity. The likely result of that would be to bring the economy to a standstill and bankrupt small and medium-sized companies. It would cause something like necrosis of the hands and feet if the blood stopped circulating in the peripheral circulatory system. The best thing for people who aren’t in the affected areas to do is to go about their lives as they always do and contribute what money they can. Finally, I sent an e-mail asking after Prof. Shimojo Masao, who sometimes contributes articles for the site (see the tags at left). He says that everything’s OK in Tokyo for now, but the more important question is how to link the disaster to the reconstruction of a new Japan. Keep in mind what Matsuoka Yuki wrote: We’ll rebuild without making a sound—so swiftly the world will be astonished. There was another 5+ Richter scale earthquake in the northern part of the country a few minutes ago. A friend in England e-mailed on Monday worried because of news about another big quake in Tokyo. He didn’t know that as of that day, there already had been more than 200 5+ earthquakes in Tokyo and points north since Friday. I haven’t heard the count as of today. Yesterday I saw a report that scientists think the force exerted by the tsunami in the Sanriku region was roughly 50 tons per square meter. One of Japan’s handicaps is that they won’t be able to look for as much assistance from the rest of the world as some people get, or they’ve given themselves. They’ve got too much money, and they haven’t accepted all the offers of help. Oh yes, and aid workers often get in the way. We’ve known that last one for a while, but isn’t the timing of the application of that knowledge interesting? I’m putting a post together now on the dark side of the post-disaster situation, and no one will be shocked to know that Kan Naoto is one of the characters. THE AMERICANS say that the sport of baseball doesn’t develop character, it reveals it. After 11 March, we now know that natural disasters do the same. They also tend to bring out the self-referential in people. “Both the Chinese ambassador Xu Jianguo and embassy officials were reported by Radio New Zealand to have asked for higher compensation payments because the one-child policy made China unique. “”You can expect how lonely, how desperate they are, not only losing loved ones, but losing almost entirely their source of economic assistance after retirement,” embassy official Cheng Lee said. Mr. Goff must live on a remote island somewhere. Doesn’t he realize that the Chinese are the flower in the center of the world? The Japanese know I’m not exaggerating. The combination of “center” and “flower” are exactly the characters used to write the adjectival form of “Chinese”, which has been borrowed for use in Japanese in the phrase chuka ryori, or Chinese cuisine. At least the New Zealanders seem to have been diplomatic enough to refrain from telling the Chinese diplomat that they aren’t responsible for the Chinese one-child policy. For Americans, apparently, everything provides a reason to talk about themselves, including the long-dreaded arrival of The Big One on the other side of the world. He does make some excellent points in the article, but that was more than six years ago. It would have been more seemly had he run one of his Song of the Week columns instead. I’m often asked where I’m from when I travel. In the past, I would hesitate to answer clearly that I’m Japanese, because it would sharply increase the possibility that I’d be gouged or deceived by local merchants. But I’ve visited more than 30 countries and had the opportunity to work with the people of many of them. As a result, I’ve come to think that the Japanese might be the most exceptional ethnic group in the world. It’s not due to patriotism, but rather to a simple comparison. That’s why I always clearly answer that I’m Japanese when I’m asked that question now. Many people have died in the Tohoku earthquake, but at the same time many people throughout the world have praised the Japanese for their behavior. One reason cited for that behavior is that we always envision the worst-case scenario, and that we are educated to do so. We always envision what can happen in an earthquake, a tsunami, or a fire, and are not negligent in our preparations. There aren’t many countries that prepare for disasters by building 10-meter-high dykes. The same can be applied to work. When working with people from other countries, I’ve noticed that if I ask them to do something requiring an effort of 10, the most I’ll get is 5 or 6. They won’t perform unless I give them detailed instructions. Many don’t even try to meet deadlines. Japanese people are capable of performing at a level of 10 even if they are given instructions on the level of 1. They always have the worst-case scenario in mind, and are not negligent in giving their best effort to deal with that scenario. They conduct their work as objectively as possible, and the range of their behavior does not come close to encompassing egocentrism. They will bend over backwards to meet a deadline. The worst-case scenario infrequently comes to pass in other countries, but that isn’t true for Japan. We were defeated in the war, and became the first country to have atomic weapons used against us—not once, but twice. Typhoons and earthquakes are always a concern. The Kobe and Niigata earthquakes are fresh in our memories. For Japanese, the worst-case scenario is always a familiar one. Every time it occurs, however, we recover brilliantly. Intending to do all that we can do, we rebuild—without making a sound, and without causing a commotion. Prime Minister Kan gives speeches with the expression of a beaten man and demonstrates no leadership whatsoever. But when has a Japanese prime minister ever demonstrated leadership? We are a people who haven’t relied on others, but have made it this far through our own individual efforts. We integrate those efforts to make outstanding industrial products. We’ve also developed a sense of service that wouldn’t be possible anywhere else. As always, the government has lost the plot, and the mass media uses emotional broadcasts to arouse a sense of crisis in Japan. But now we have Twitter, which we use to share information and encourage each other, and we’re connected to the world with Facebook. We will recover brilliantly without making a sound–so quickly the world will be astonished. Does Mr. Matsuoka strike you as arrogant and self-centered? Perhaps he is. Let’s get this one out of the way now. People who should know better will subject us to a lot of glop in the coming months and years. One who really should know better–and should have known since his undergraduate days–is Larry Summers, the former Harvard University President, the former Director of Obama’s National Economic Council, the former Chief Economist at the World Bank, and the former Secretary of the Treasury under Clinton. There’s a lot more at that post that’s worth reading too. Reader Slim assures us that there were reams of sober and factual news coverage by responsible members of the media in the West. That must not include the New York Times. Their slide show is headlined, “Paralysis Across Japan”. No, it’s an obstruction across one part of Japan. Where I live, and most other places, people don’t have the palsy. They’re moving around like they always do. It also doesn’t include the Irish Times, which headlined an article, “Japan’s belief that technology could tame nature is shaken”. True, it’s not the first time David McNeill has presented the consumers of his journalism with figments of his imagination, but anyone who spends more than three weeks in this country should know that, if anything, Japan’s belief is just the opposite. He probably does too, but I guess you gotta write what your editors want you to write. Shame he enjoys it so. Then there’s the headline writer of the Times Colonist, a Canadian newspaper. The paper ran an article by Reuters for the hanky brigade about how tough things are now for many people, but the headline writer was gripped by a seizure of fantasy and wrote, “Desperation and Panic Grip Japan after Massive Quake”. Desperation and panic probably gripped the considerably fewer than 127 million people who thought their lives were ending, but not after they survived. Again, if anything, the truth lies 180 degrees in the opposite direction. If anyone is desperate and panicky, it’s the stockholders of newspapers looking over the latest quarterly report. “Within the dark and fetid wards of the Senen General Hospital, some 120 patients lie in their beds or slumped in wheelchairs, moaning incoherently. “”There is no food!” cries an old man in a blue gown, to no one in particular. Readers who can hold their noses through the dark and fetid swamp of prose will find that the hospital is without power and running water, and the people who work there are doing the best they can. I hope Alabaster helped them out and brought along plenty of food and water when he came to interview them. It takes real talent to follow a non sequitur in one sentence with nonsensical filler passing as geostrategic analysis in the next. How useful that talent is, I don’t know, but it is a gift. His article does raise a question, however. Westerners in general, and Americans in particular, think of themselves as autonomous, free-thinking units, and the Japanese as rabbit hutch-dwelling drones too timid to upset group harmony by acting on their own. Why then is it that the Westerners think a disaster demands a secular sermon from the political leader of the moment to heal the wounds and stop the waters from rising, while the Japanese couldn’t give a flying furoshiki what the man in the Kantei says and get on with the work that has to be done? Those readers who wish to subject themselves to the complete versions of these sober exercises in factual journalism have enough clues to access them through the search engine of their choice. Japanese readers have been the first to point out that we shouldn’t expect all of them to be saints. Reader Get A Job Son (haven’t you gotten a job yet?) offers a short Japanese language piece from NHK about looting in Miyagi. The local police say that in the 72 hours after the earthquake, there were 40 incidences of theft, mostly food from closed shops. The value of the losses was JPY 1.6 million (just under $US 20,000), but one incident alone accounted for roughly JPY one million of that total. That’s not sainthood, but it’s not perdition either. Most countries would be glad to use that as an excuse to self-reference their wonderfulness. People have been remarkably level-headed and composed, but there are always exceptions. Wouldn’t you know that one of them would be Tokyo Metro Gov. Ishihara Shintaro? He wound up apologizing after his remarks irritated Miyagi Gov. Murai Yoshihiro. What he really should do is apologize to the people of Tokyo for running for a fourth term in the election next month. Maybe there’ll also be frogs, birds, and swastikas falling from the sky. BUSY with work at the moment, but a reader sends in this blog post from a native English-speaking foreigner in Japan with a small software business and a background as an engineer. The subject is what went right in Japan over the past few days. Judging from the comments, it puts the “reporting” from the U.S. and Great Britain in much-needed perspective. That’s one reason why the Japanese don’t need to look to politicians at times such as these. That isn’t to say there aren’t a few problems with the post. He incorrectly states that Honshu is larger than Great Britain. (It isn’t, but just barely.) He’s also incorrect to say that typhoon was originally a Japanese word. (The fact that tsunami is now an English word, and has been for decades, helps support his argument.) Some of it is a bit over the top in a software engineer sort of way, but all of us are what we are. The comments are worth reading too. There’s the usual snark that comes with opening Internet sites to commenters. One guy thinks a million people are on the verge of starvation. A few others are upset because the Japanese are…well, Japanese, from what I can tell. Remember what I said about people overseas indulging their emotions? This person is talking about coverage outside of Japan. I suspect we won’t be seeing any more articles for awhile about a defeated country slinking off the world stage, written by people who don’t know snot from day-old chewing gum when the subject is Japan. If what you know about Japan you learned from the overseas mass media, then everything you know about Japan is wrong. Back when I have the time. Thanks to AK for the link. UPDATE: Link from James A. with some more calm analysis. HERE’S a quick quiz for those familiar with the people in Japanese politics: If you had to guess which politician would be the first to break ranks and try to turn recent events to their party’s advantage, who do you think it would be? Did you say Fukushima Mizuho of the Social Democrats? Got it in one! She chaired a meeting of her party–in an office, though they could have used an airport limousine bus–and took the opportunity to complain about the government’s information management. Her party is the standard-bearer for Japan’s loony left, so of course they detest nuclear power. She complained about that, too, even as people were putting their lives on the line in Fukushima Prefecture (no relation) to bring the problems with the nuclear plants there under control. Her complaint amounted to: We told you so! She plans to make an issue of it. There was one benefit to watching the brief film clip on TV. One couldn’t help laughing to see her dressed in work coveralls. If she’s going to zip them up to her neck, she probably shouldn’t have worn that designer outfit underneath. It looked awfully lumpy. To give you an idea of the tilt of her gyroscope, she complained last week that the Kan Cabinet idea to raise taxes was evidence that it was “neo-liberal” and Koizumian. Meanwhile, LDP head Tanigaki Sadakazu said that while there’s a lot they don’t like about the DPJ budget, his party is willing to be flexible on their demands to facilitate the recovery. Some in the party want the government to divert the funds for the child stipend to relief efforts and infrastructure repair. The government will convene a special committee tonight to hammer out a policy to handle fund allocation. In other news, Prime Minister Kan appointed reform minister Ren Ho to be in charge of the effort to save energy, with rolling blackouts to start tomorrow. That’s reasonable, considering she’s a TV announcer/model turned politician. Her job will be to appear before the public and urge them to cut consumption to a minimum. Mr. Kan also appointed unaffiliated MP Tsujimoto Kiyomi to be his aide in charge of coordinating volunteer efforts. That makes sense from one perspective, considering her work to create Peace Boat (who are anti-nuclear power too). She’s also probably well-connected to the NGO types. On the other hand, the It Girl of the hard left once told a reporter in an unguarded moment that she thought her job as a Diet member was to destroy the country. One has to wonder once again what possessed Mr. Kan to make such a personnel choice. Quick update: Mr. Kan just finished a pep talk to the nation live on television, and he came very close to losing it. Fortunately, he didn’t (as he was praising the people for maintaining their composure), and just as fortunately, he was followed by Chief Cabinet Secretary Edano Yukio, who quickly restored the equilibrium. The prime minister needs a pep talk more than most of the people in the country. From what I’ve seen the rest of his Cabinet have presented themselves very well. On another note: There’s a report that more than 300 important cultural treasures (i.e., Buddhist temples, Shinto shrines, etc.) were damaged (to an undefined extent) in the earthquake and tsunami. SUNDAY’S edition of the Nishinippon Shimbun has a Kyodo report datelined from Beijing and headlined, “High Praise for Japanese Composure”. They write that the Chinese corner of the Internet is filled with commendation for the Japanese attitude and give specific examples. A correspondent from a Chinese newspaper in Hunan Province studying Japanese in Tokyo was equally impressed by the coolness of his Japanese teacher during the earthquake. The teacher directed the students to safety, was the last to leave, and calmly turned off the lights. Some are also envious of the sturdiness of Japanese school buildings, with good reason. One person writes that during the Szechuan earthquake of May 2008, “Chinese schools were hell, but Japanese schools are evacuation sites.” He adds that 5,000 children died in those Chinese earthquakes because the school buildings collapsed and teachers ran out of the classrooms leaving their students behind. Finally, the government-affiliated Global Times, known for its belligerence during the Senkakus Incident last year, headlined its front page with this: “The World is Impressed at Japan’s Composure”. Quick update: Unpleasant news…the government thinks fatalities will reach 10,000. They’re also worried about another explosion at the Fukushima power plant, though Mr. Edano says it won’t be of the worst kind. Rather, it will the same kind as yesterday. He’s also providing more explanation than he did yesterday. YOU KNOW that the situation has evolved when the politicians are throwing darts at each other on television. Representatives of all the parties in the Diet discussed the matters at hand on the NHK Sunday morning political blabathon. Everyone was level-headed and no one was posturing. The primary topic of the segment I saw was how to handle the national budget, which is a pressing question because the fiscal year in Japan starts in April. Had normal circumstances prevailed, issues with the budget would probably have brought the Kan Cabinet down this month. The representative from the ruling DPJ mentioned that they had to maintain their only real achievement, the budget-busting and controversional cash stipend from the government for child-rearing. One of the opposition politicians said he was surprised to hear that, considering all the money that would be required for relief and infrastructure repair. Otherwise, everyone maintained the same calm, clear-eyed determination that has defined the country’s response since Friday. There were criticisms about the amount of information released in regard to the problems with the power plant in Fukushima and the difficulty the layperson would have understanding much of it, but that’s legitimate. On the other hand, the educational system here is such that in general, people are more comfortable with handling numbers in unfamiliar scientific units than those elsewhere. In one sense, that means this is the morning after, even though it’s the second morning after. In another sense, we’re not out of the woods yet. The aftershocks are still strong and frequent, and they are made more dangerous because structures have already been weakened by previous earthquakes. There are still serious problems at the Fukushima power plant, and they declared a state of emergency there early this morning. They’ve been adding water to a third reactor on the site, but that system broke down, lowering the water level and probably exposing the fuel rods. 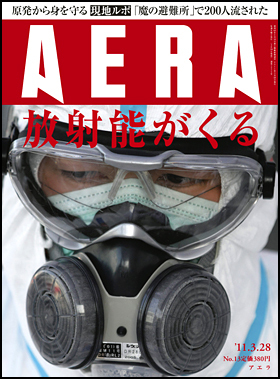 Nineteen people were confirmed to have suffered radiation exposure. The latest estimate on fatalities is about 1,700, and there is now a report that they have yet to confirm the whereabouts of about 10,000 people. How many of those are among the more than 300,000 people now in shelters is not known. There is still not the slightest sign of panic or hysteria in public, not to mention wild, uninformed speculation. I’VE glanced at a few American websites and their coverage of the events in Japan. (T)he (news) reader dispenses the facts with an almost eerie calmness as all hell breaks loose in the clips shown. The shots of the tsunamis sweeping through port cities looks more like a horror movie than a news broadcast. “If this is the same town (and judging by the map it’s in the right area), the population is in the neighborhood of 77,000. He then offers a long quote from H.G. Wells. This site also corrects an English-language report that said 88,000 people were missing. At no time in Japan have I ever seen anything that suggested there were more than 1,300 or so dead and missing combined. Do you see what I mean now? No one in Japan is behaving like this. No one in Japan is using anything remotely like this kind of language. The Americans are only spectators, but they’re the ones indulging their emotions. The Japanese are the ones who have to deal with it, and their upper lips are stiff. Notice that one of the people I quoted thought the Japanese calmness was “eerie”. One gets the impression that the Americans are excited by all the shock and awe. I think we all know what the tone of American coverage would be like if this were a local disaster. Meanwhile, earlier this evening on NHK, I saw a video of the tsunami hit a small town on the coast. (I missed the first bit, so I don’t know which town.) A huge mass of water filled with debris rushed through the streets, knocking down light poles and lifting houses off their foundations. The video was taken from what seemed to be a parking lot on the side of a hill looking down on the town and the small waterfront area. A group of people stood watching at the edge of the area behind a chain link fence. All the adults were quiet, and only a few children were crying. The American above would probably think they were eerie, too. There was a quick shot of one mother comforting her daughter. The woman, about 30-35, was not crying at all. The person on the scene who filmed the video, or was accompanying the person filming the video (I’m not sure if they were part of the media) yelled, “Sugoi!” two or three times. (In this context, terrible, or horrible). Then again, he was there watching it as it happened. No one else said that, even though they were probably thinking it subliminally. I’ve long thought that the Japanese have a more solid grasp of the brass tacks of life than do Westerners. Now I’m convinced. UPDATE: Reader M-Bone makes the following points. I agree. The 88,000 missing number started circulating in a number of UK newspapers. Since it is roughly the same number as the official number of people stuck in central Tokyo who “had not yet returned home”, I am guessing that these papers either screwed up the Japanese here or more likely were using machine translation. No matter which it is, this frightening number, attributed to “Japanese officials”, is a very bad mistake. Hundreds of websites claiming 88,000 confirmed missing reported by “the official Kyodo news agency via BBC” among them ABC, Huffpost, etc. No sign of this anywhere from Kyodo in Japanese or English. BBC website has removed the claim. Some sites have changed this to 88,000 dead.